I've been struggling recently to come up with things to post about. I've been quite distracted, with my brain full of planning for summer camps and organizing all the the stuff that go along with with that. It seems boring to talk about calls that end with a "no" or printing hundreds of health forms to send out to potential campers. I've been busy listening in on the Missouri Senate and the work on the midwifery bill that currently there (as of yesterday, it was perfected!) We have thismuch time to get it passed. I've been trying to keep up on housework, which always falls to the wayside when I sit in front of the computer. So, I've been trying to cut back on computer time, and spend more in productive activities, like chores or playing with Elizabeth. She has added the "more" sign to her repetoire. She loves dogs and cats, and screeches whenever she gets close to one. When you ask: "what does a dog say?" she says, "ruff, ruff, ruff!" When you ask, "what does a bird say?" she says, "ruff, ruff, ruff." Got me on that one. When we read a certain book, there's a part where the "wind blows" and whenever we reach that page, she says" whoooo.... whooooooo!!!" 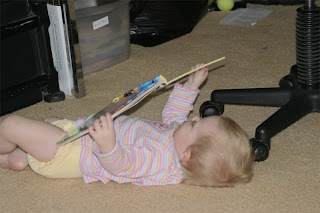 She likes to read - she bring me books, and sometimes, she just sits down and flips through books all by herself.